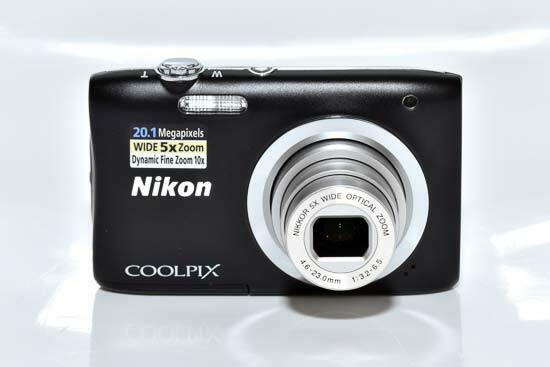 The Nikon Coolpix A100 is a budget compact camera with a 20.1MP CCD sensor and a 5x optical zoom range equating to 26-130mm. The camera will record HD 720p video, and it packs some fun creative effects including Nikon’s Smart Portrait mode that automatically enhances shots of friends and family. The Coolpix A100’s svelte design can be had in five body colour options and is available exclusively at Argos in the UK for £89.99. Firstly, let’s get one thing straight: the Nikon Coolpix A100, despite its new name, is not a new camera. Apart from a couple of negligible styling tweaks, the A100 is identical to 2015’s S2900, which itself was essentially the same as 2014’s S2800. Renaming a camera rather that improving it is nothing new, and unfortunately it’s now becoming commonplace in the budget compact sector. With the relentless drive to improve smartphone cameras, the market for the standalone point and shoot snapper is rapidly decreasing, therefore it’s no surprise that camera manufacturers aren’t exactly eager to invest resources into developing all-new models. But at least the Nikon Coolpix A100’s tried and tested design doesn’t throw up any surprises. Its controls are exactly where you’d expect and you needn’t worry about learning any new technology. The A100’s rear panel is predominantly devoted to a 2.7-inch 230k-dot monitor that has acceptable horizontal viewing angles but appalling vertical visibility, which is a pain when composing high or low angle shots. You can also forget about luxuries like touch sensitivity, and the low resolution means fine image details and menu icons are pixelated. The LCD’s one positive aspect is brightness, which is enough to counteract direct sunlight, but otherwise even a mediocre current smartphone will thrash the A100’s screen quality. Next to the screen is a typical array of traditional controls, with the raised video record button doubling as a small but helpful thumb rest. There’s no obvious gripping point on the front of the camera for your fingers, however the Nikon logo is slightly embossed and textured, giving you just enough to grip on to. 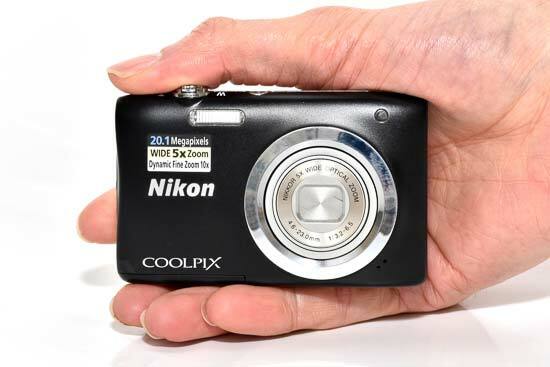 But while the Nikon Coolpix A100 doesn’t feel overly secure in the hand, it’s certainly a whole lot more comfortable to use than a smartphone, yet its fairly slim 19.8mm thickness and tapered corners mean it’ll still slip easily into a tight pocket. The camera’s 119g ready-to-shoot weight is also very light and actually undercuts most high-end smartphones. Beneath the video record control is the playback button, which sits to the right of the mode selector button. This reveals five main shooting modes, including the default Scene Auto Selector mode that automatically detects the type of shooting scenario you’re about to capture and applies the most appropriate settings. The second mode lets you manually select various scene modes, one of which is Panorama Assist. However, as its name suggests, this isn’t and automatic sweep panorama feature, but rather a function that overlays a partial ghost image of the previous shot taken in a panorama sequence to help you line up the next overlapping photo. Next up in the main mode menu are the eight creative effects modes, each of which is previewed in real time. Check out the image quality section of the review for examples. Nikon’s Smart Portrait system is given its own dedicated mode setting, which makes sense as this is a fairly comprehensive feature that can transform an otherwise unflattering portrait. The system works by automatically smoothing skin and applying virtual foundation make-up, plus it’ll soften an entire image and adjust colour saturation and brightness. It all works surprisingly well, but if you forget to activate it, you can always enhance a portrait shot in playback mode using the Glamour Retouch feature. Here even more touch-up options are available, including chin size manipulation and skin glare reduction, along with scope to adjust eye size, colour and whiteness, and even reduce under-eye bags. You can finish things off by reddening cheeks, adding some virtual mascara and applying lipstick. Providing your subject is directly facing the camera and fills most of the frame, these effects are targeted accurately at their relevant facial features. The fifth and final shooting mode is Auto mode, which functions like a programmable auto mode. Here the camera retains control of shutter speed and aperture, but you get to choose white balance and ISO sensitivity settings. In Auto mode, the A100 also has options for changing the focus point between face priority, subject tracking, target finding, centre and manual point selection, plus there’s the ability to switch between single and full-time autofocus. Auto mode also reveals the continuous shooting option. To adjust any of these settings, you simply press the Menu button located at the bottom of the rear panel. 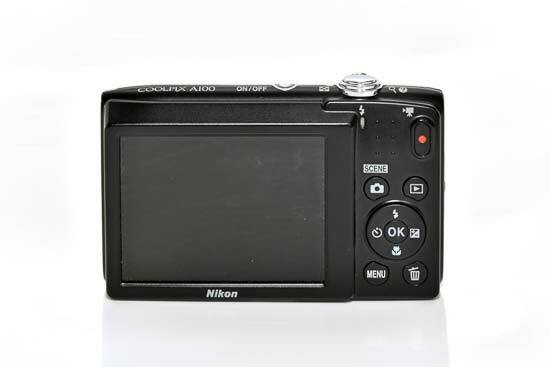 The remaining controls on the back of the Nikon Coolpix A100 include a directional control pad that doubles as controls for the flash (chose between Auto and Off when in Scene Auto Selector mode, while Auto mode adds Auto with red-eye reduction, Fill flash, and Slow sync options), self-timer (2 and 10 second delay options are available), macro mode, and exposure compensation (+/-2EV). On the top of the A100 you’ll find the power button and shutter release button that’s surrounded by a conventional zoom rocker ring. This only has one speed, so making very fine focal length adjustments can be slightly hit or miss. Flip the camera over and there’s a tripod mount, as well as a single socket that takes care of charging and AV output duties. Alongside this is a small door covering the battery and SD card compartment. When it comes to shooting with the Nikon Coolpix A100, it’ll power on in a fairly spritely 2 seconds, but from then on Nikon’s lack of technical development starts to show. You’ll have to wait up to three frustrating seconds between snapping a shot and being able to view it, thanks to the camera’s outdated and underpowered image processer. At least the autofocussing system is pretty nippy and doesn’t slow too much in low light, although in these conditions the A100’s autofocussing isn’t entirely reliable. Macro focussing is much more hit or miss, however. In the default Scene Auto Selector mode the camera struggles to detect close subjects and often requires you to leave more than the quoted 10cm minimum distance in order to focus. To get more consistent macro focussing, you’ll need to switch to Auto mode and manually activate macro focussing using the rear panel Macro button. It’s a tedious workaround to an issue that should have been properly addressed years ago. Finally, unlike the cheaper Coolpix A10 that’s powered by two AA batteries, the A100 uses Nikon’s EN-EL19 rechargeable Li-ion battery that’s rated for a reasonable 250 shots per charge.